Suffering: The Problem & Solution. Suffering is a very real and ugly reality. Billions are affected or infected by suffering and looking for light in their darkness. The Hindu festival, called the Kumbh Mela is regarded as the biggest peaceful gathering in all of the world. As many as 75 million devotees are expected to gather in Nashik, in the next couple of months to dip themselves in the Godavari River and “liberate” themselves from all the “miseries and sufferings of life”. I believe one of the strongest motivating factors that draws so many people to a cold, dirty river is the hope of deliverance from all the suffering of this world. An eternal life free of sin and suffering is indeed worth pursuing. But how to do this is the “million dollar question”. Hindus view suffering as punishment for “sins” committed in this lifetime or past lives. Individuals’ suffering is all part of good or bad “Karma” that is part of a cosmic cycle of birth, life, destruction and rebirth. Hindus believe victims will be reincarnated and may be happier in their next life. Karma is understood within Hinduism—and Buddhism and Jainism as well—as the fundamental and universal law of cause and effect. They believe when a person does something, it has an effect: good actions have good effects, bad actions have bad effects. All these bits of karma—good and bad—are something like spiritual baggage, or deposits in a spiritual bank account. When a person dies, all of his or her karma is, in a sense, added up. They believe a “positive balance” leads to a more positive rebirth; a “negative balance” leads to a more negative rebirth. Similar to Hinduism, Buddhists believe suffering to be the result of bad karma, not a fallen world. The recognition of suffering in the world is the first noble truth of Buddhism, and has one of the most radical systems of self deliverance from suffering. Suicide is even an acceptable form of “transcending” this suffering. Jains view the world in which we live to be full of misery and suffering and the souls enslaved to matter. Jains use the presence of evil as a reason for denying the existence of an omnipotent, holy Creator. Jains worship themselves because they believe they have achieved perfection, and have become liberated from the cycle of birth and death. Contrary to the teaching of total depravity, they believe anyone can become a ‘god’ because every being has the potential to become such a perfect soul. The very word “Islam” means “submission.” Many Muslims understand that to include suffering, is a way of submitting to the will of Allah. Some suffering is Satan’s doing or is the work of his associates in the spirit world (the “jinn”) and is allowed by Allah as a test of humility and faith. Many Muslims believe suffering and adversity strengthen one’s faith, as pain often leads to repentance and prayer and good deeds. Free will and human responsibility which the bible teaches is not embraced. Just like these other religions, Christianity recognizes suffering in this world. Pain and suffering entered the world when Satan brought sin into the Garden of Eden, not because of bad “karma”. (Genesis 3:17-19). The Bible makes it abundantly clear that all of us are tainted by and infected with sin and its curse of suffering (Rom 3:23; 1 John 1:8). But contrary to what the Buddhist, Jains, Muslims and Hindus believe, the Bible teaches salvation in this corrupt physical and temporary world only comes through having a “saving relationship” with Jesus Christ, who died on the cross for our sins, to restore humanity. Unlike Buddhism, Hinduisms, Islam, and Jainism which depends on the works of the individual for salvation from this curse, salvation in Christianity is dependent on the work of Christ alone not human charity or effort (Romans 3:23-26). By putting faith in Jesus Christ, our account of sin and suffering is transferred to His work on the cross. By His death, Jesus paid for our sins; he took our suffering upon himself, to purchase our redemption with His blood. Salvation is a gift from God to humanity; a person cannot “attain” their own salvation (Ephesians 2:8-10). For now, everyone suffers and dies. The Buddha taught his followers to escape suffering while Jesus showed us the way to go through it. Contrary to all other religions, the hope the Bible gives, is not escape or deliverance from suffering, but rather victory over suffering. “Who shall separate us from the love of Christ? Shall tribulation, or distress, or persecution, or famine, or nakedness, or danger, or sword?” (Romans 8:35). The answer is nobody and nothing. “In all these things [Christians] are more than conquerors” (Romans 8:37). The cross of Christ calls us to suffer and secures our triumph. The victory won by Jesus through his death and resurrection is given in the Bible as the guarantee of his final triumph, when he will judge the world and usher in “a new heaven and a new earth, the home of righteousness” (2 Peter 3:13). In that day “He will wipe every tear from their eyes. There will be no more death or mourning or crying or pain, for the old order of things has passed away” (Revelation 21:4). The Bible teaches that suffering can only be ended by coming into a right relationship with God, and this can only be done through Jesus Christ. Suffering ends because it is faced with God’s strength and comfort here in this world, and it ends ultimately when one enters Heaven after death. Suffering is certain. Salvation is sure. One of India’s biggest Hindu festivals, Kumbh Mela, began on Tuesday morning here in Nashik. The last Kumbh Mela in Nashik saw 7,5 crore (75 million) pilgrims and sadhus travel to Nashik to take a holy dip in the sacred Godavari River. This Kumbh Mela is the most sacred of all the Hindu pilgrimages and is regarded as more auspicious than the annual Diwali and Holi festivals. They believe that dipping themselves in this river will wash a person clean from all their sins and recognise this Kumbh Mela to be a “golden” opportunity to “liberate” themselves from all the “miseries and sufferings of life”. Kumbh Mela is celebrated every third year in four different locations (Nashik being one of the four locations). Nashik hosted their last Kumbh Mela twelve years ago. The pilgrimage is held for about 2 months, when Jupiter and the sun are in the zodiac sign Leo alignment (Simha Rashi). Hinduism teaches that drops of nectar fell from the kumbha(vessel) carried by gods after the sea was churned. One of these drops spilled into the Godavari river making it “divine”. According to Hindu mythologies, the Kumbh Mela is the only time and place in the world where a person can “disburden” his sins and achieve ‘Nirvana’ from the vicious cycle of birth and re-birth. 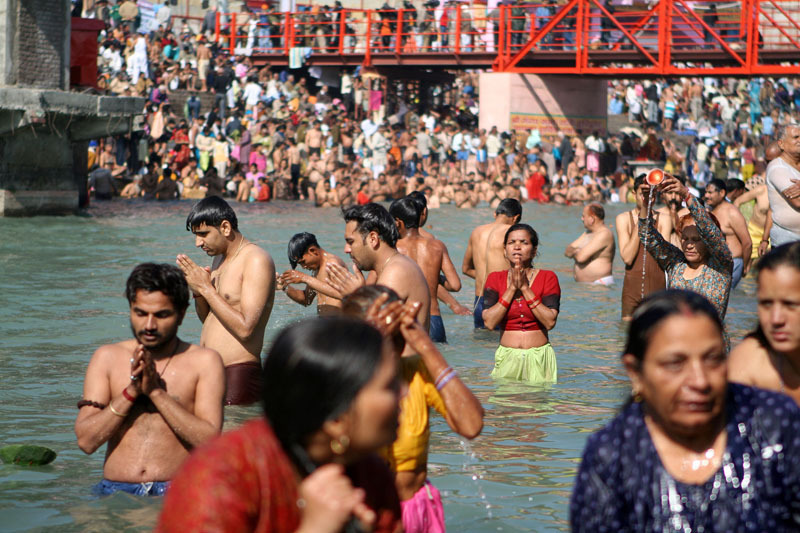 The Hindus believe that by taking a holy dip in the sacred water they will be able to wash away all the sins they have committed in the past and pave way for attainment of Moksha. The “power of faith” can indeed be a wonderful as well as a scary experience. Without a doubt these pilgrims coming to the Kumbh Mela have faith. It takes an extra-ordinary faith to believe that your soul has to travel through 8 400 000 species before it reaches a human body. And only once your soul is in a human body, (Hindus believe) can you then start working on your own “karma”(good works) in order to achieve Moksha. As you watch these pilgrims perform these “pujas” and rituals you cannot help yourself but to agree with Mark Twain, that this faith born from this act (or this act born from this faith) is indeed beyond imagination. But, as millions of devotees gather, the question remains, is this type of faith enough? Will all this devotion, sacrifice, good works, self denial, suffering and effort “disburden” our sins and liberate us from the “miseries and sufferings of life”? If you take poison (thinking its medicine) all the faith in the world (no matter how powerful) won’t bring you back to life. So this question is of eternal significance. The destination of our eternal soul requires us to make the right choice and to have the right type of faith. Mahatma Gandhi’s faith failed him at the end of his life. He had been searching for light in all the wrong places. He rejected the one and only true light. Jesus said in John 8:12, “I am the light of the world. Whoever follows me will not walk in darkness, but will have the light of life.” Sadly the Mahatma believed that Christ was just another way. His object of faith was in his own works (karma). Even though he believed in and respected Jesus Christ, it was not enough. Even Satan and his demons believe in the true God (James 2:19), but they don’t love and obey Him. Their faith is misplaced and not genuine. So the question remains, what type of faith do you have? Is your faith in your works (karma)? Ephesians 2:8,9 says “For by grace you have been saved through faith. And this is not your own doing; it is the gift of God, not a result of works, so that no one may boast“. 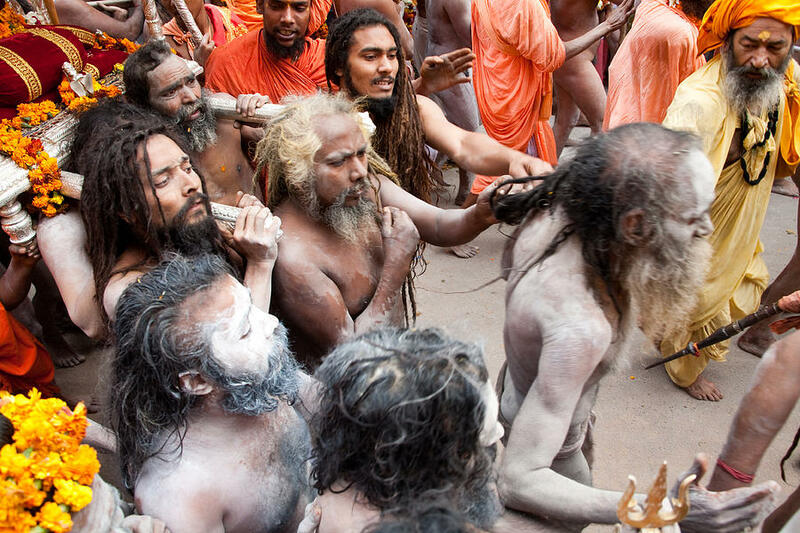 Is your faith a cultural faith dependent on works like the faith of the devotees at the Kumbh Mela. Is your faith in a person, swami, guru, prophet or priest? Or is your faith rooted in family or heritage or a religious ritual like baptism, or even church membership? Is your faith in a profession you made or a covenant you signed? Or is it temporary faith, like the Jews, who turned away from Christ once they understood their need to bow their knee to the Sovereign Lord Jesus Christ? Is it a faith in faith, instead of a faith in the resurrected Christ of God, Jesus of Nazareth? The good news of the gospel is that no one else but Christ died for sinners like us. And he rose physically from the dead to validate the saving power of his death and to open the gates of eternal life and joy (1 Corinthians 15:20). In Christ alone, God extends the perfect blood and righteousness of Jesus as the only suitable payment for our sin, “For he hath made him to be sin for us, who knew no sin; that we might be made the righteousness of God in him.” 2 Corinthians 5:21. Our faith needs to be in the person of Jesus Christ and His work (sacrifice) alone for us and our salvation.